UTSA researcher studies how technology is changing the game day experience for fans. (Oct. 2, 2018) -- Virtual Reality (VR), augmented reality (AR), drones, and other technologies let fans experience their favorite sports like never before. This technology makes sporting events immersive, allowing audiences to be courtside or inside a football stadium without ever having to leave their home. AR and VR use by sports fans is limited right now, but the demand to use it is predicted to grow. According to the International Data Corporation (IDC), global shipments of AR and VR headsets are expected to total 4.2 million units in 2018, up 31 percent from 2017. 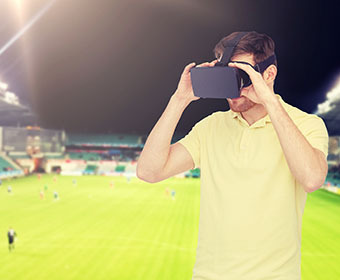 Seok Kang, a professor in the UTSA Department of Communication, is studying what factors cause the lag in VR use amongst sports fans and what influences fans’ use. According to Kang, the adoption rate of VR sports using a VR headset is in its inceptive stage mainly due to the purchase of headsets and the variations in quality and formats offered on the market. Kang was awarded an Internal Research Award (INTRA), through the Office of the Vice President for Research, Economic Development and Knowledge Enterprise (VPREDKE), to conduct research on what factors (system, technology, audience, social and use) would play a bigger role in users’ adoption decisions. Some topics Kang hopes to explore through his research are how fans feel when they watch the sporting event using a VR headset, how fans process information with VR, and how cognitively or emotionally engaged fans are when using VR. “The changing media environment from consumption to experience is contributing to the diffusion of VR for sporting events,” said Kang. In 2018, live virtual reality coverage of the XXIII Winter Olympic Games in PyeongChang, South Korea, was offered to users with Windows Mixed Reality headsets, Google Cardboard, Google Daydream, Samsung Gear VR through the NBC Sports VR app. Fans were also able to experience soccer matches using VR during the 2018 FIFA World Cup. Kang hopes this research can be used by professionals and information and communication technologies (ICTs) researchers with information on what factors benefit or impede in the VR adoption process. “In the digital age, media organizations can use technology to offer a new experience to fans. With VR, fans can expect to enjoy their favorite sports events by virtually being in the game site,” said Kang. Kang has done research on the use of mobile devices in sports consumption in the past. He researches mobile media effects, social media effects, digital media production, journalism, and new communication technology market analysis. Kang teaches courses on social media, mobile communication, and digital media production in the UTSA Department of Communication, within the College of Liberal and Fine Arts (COLFA). COLFA is one of UTSA’s most academically diverse colleges and largest with nearly 6,500 students in 11 departments in the arts, humanities and social sciences. Learn more about Seok Kang. Learn more about UTSA Department of Communication. Discover the UTSA College of Liberal and Fine Arts.